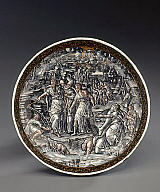 This shallow-footed bowl is painted in grisaille (monochromatic tones) with salmon-pink flesh tints and gilded details. The interior scene represents Moses striking water from the Rock of Horeb at the command of God, who emerges from the clouds at the upper right (Exodus 17). Sculptural scrollwork, river gods, and grotesque masks animate the underside of the basin. 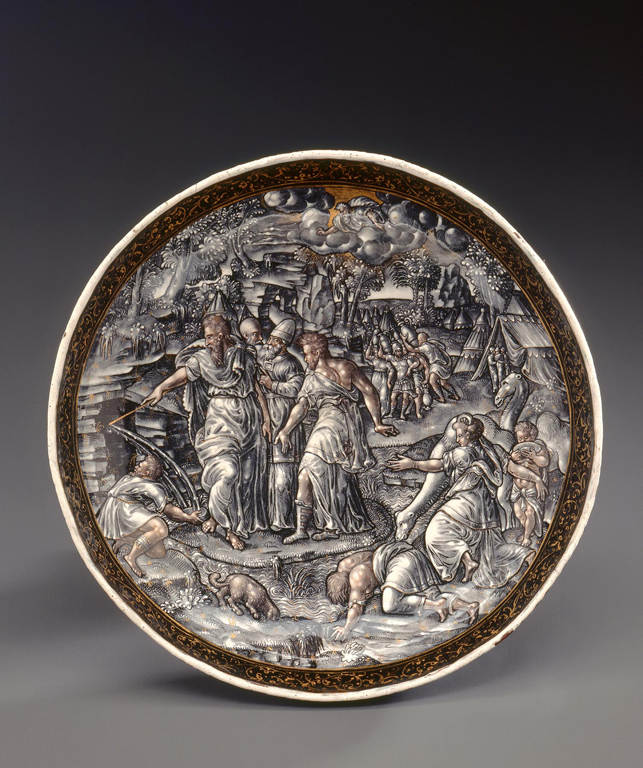 Winters, Laurie et al., A Renaissance Treasury: The Flagg Collection of European Decorative Arts and Sculpture. New York: Hudson Hills Press, 1999, p. 53-55, cat. 14, color illus. p. 54, b/w illus. p. 53.